I wanted to make note of the chrome extensions that I've come across somewhere, preferably not on my system and somewhere online because I'm afraid that I might *accidentally* format my hard drive while attempting to reinstall an OS (yes, that still happens). And maybe, just maybe, some of you will find them interesting as well. There'll only be one extension left from now on, Save to Pocket. The extensions make chrome heavy for my already burdened laptop and I don't want to trouble it any further. (un)clrd is a chrome extension that turns the internet black and white. Daltonize is one of the more interesting extensions that I've come across on Chrome, one that exposes details so it's easier for color-blind people to notice details, which they would've otherwise missed. 'Why isn't the galaxy more colorful? The pictures of it that we've seen online are very very colorful' is one of the common complaints that I've gotten when we introduce students to the night skies. The concept of False color images, how they are recorded and how they are clubbed together to make the multi-colored pictures are what follow as my answer to that question. Before I get back to business, I thank Shruti and Ritwika for taking my place when I was away. I'm trying my best to write everyday and I wanted the blog to chug along even when I'm not around. I thought about writing posts and scheduling them to be posted automatically everyday but well I didn't want to do it and I couldn't write enough posts in advance. So I ended up asking a couple of friends of mine if they could write when I was away. Luckily enough, three of the two people I asked said yes and Yayy! It has worked out wonderfully, in my opinion! Pretty much all I did during my vacation was ask questions, a few of which are still stuck in my head. One of them is regarding satellites that specifically monitor industrial exhaust for their harmful gases. Now, in all seriousness, the last post was pretty much all of the science I had up my sleeve. So, today, I am just going to talk about, um, whatever comes to my mind. And I have decided that a lecture on en dashes and em dashes would be boring and long-winded, and would not serve much of a purpose. So, on this fine Christmas night (yes, I slept all day :D), let me start by introducing myself. I am Ritwika, friend of Rahul’s (who has graciously allowed me the use of this blog), owner of two non-functional blogs (I am that lazy), final year Physics student at IISER T, consummate PhD hunter and also, aspiring writer. Additionally, I tend to write in long, rambl-y sentences with lots of brackets and dashes. Rahul, you will have to overlook that. There, that covers all the bases. Now, when Rahul – or Poruri, as I call him – asked me whether I could blog in his absence, I thought I could get away with writing anything that came to my head, but after having read the stuff that is here, I realise that this is a predominantly science-y blog (ooh, on that note, a huuuuge shout-out to both Poruri and Shruti for their wonderful posts). So, at least for today, I will stick to tradition. ​Hello there readers (yes, all four of you), I'm back with the final installment of the Particle Physics Trilogy for Astronut. In my first and second posts, I gave a brief overview of the structure of the Standard Model of particle physics and went on to make a case for the existence of physics beyond the Standard Model. In this post I'm going to talk about one of these extensions of the SM, called Supersymmetry (you can call her SUSY)- which is also what will hopefully give me my PhD at the end of <till the funding runs out> years. I'm afraid that this post is going to be a bit of a let-down, because I'm putting it together in a hurry but more so because we are now near the boundaries of my knowledge of particle physics- there is still a semester to go before I take the graduate level Beyond the Standard Model course! So please bear with the occasional vagueness. Look who's back (back again). The last post saw me attempting to give a somewhat coherent and extremely condensed introduction to the Standard Model of particle physics. As a quick recap (this is me practicing for when-or if- I ever become a professor), we saw that the SM consists of two classes of particles- fermions and bosons. The fermions are matter particles and the bosons carry forces that mediate the interactions between these fermions. All stable matter is made up of first generation fermions; and three of the four fundamental forces of nature have corresponding bosons. The gravitational force hasn't made it through the selection committee to the team yet. Ground Control to Major Tom: Shruti Patel checking in. Since my dear friend and fellow-physicist Rahul Poruri is homeward bound, and shall remain there for a week, I'm stepping in to continue his tradition of daily posts to Astronut. Even as I write, I'm not quite sure what this post is going to be about, so please forgive me for occasional rants and digressions. By the way Rahul, I totally resent you for the name of this blog- I'm never going to start my own blog because there's no way I'll come up with a name as cool as Astronut! For now, I shall try and be happy with being a guest writer! I am going home for the next couple of days, till next friday to be exact and in my absence, my dear friend Shruti Patel will be writing the daily posts. She was my classmate at IIT Madras and she is currently pursuing a PhD at DESY. I'll let her get into the specifics of her work. Radio and optical telescopes observe the radio and optical portions of the electromagnetic spectrum correspondingly. 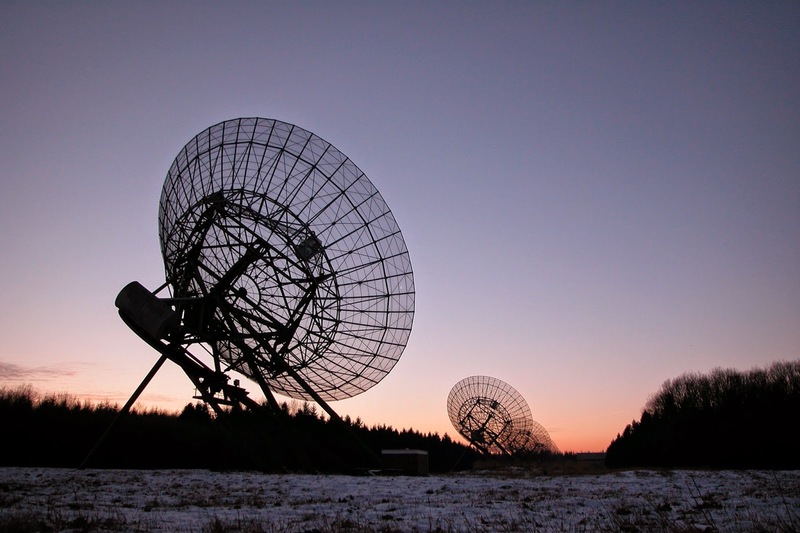 But radio telescopes are fundamentally different from their optical counterparts. Radio telescopes don't have CCDs. They don't need finely polished mirrors and they are much, much bigger in size. So. Why the fundamental difference? Let's take a detour and remind ourselves of the wave-particle duality of light. The popular young's double slit experiment is explained using the wave theory of light where as photo-ionization is explained using the particle theory of light i.e using photons. A wave can be described using y = A cos( omega*t + phi ) where omega is two pi times the frequency, phi is the phase and A is the amplitude of the wave. A photon on the other hand can be described using h*nu where nu is the frequency of light. This fundamental difference is what, as you will see in a moment, lead to the differences between optical and radio telescopes. I've been using linux for over 5 years now and I've had to reinstall one or the other version of it every year, and sometimes more. And every time I reinstalled it, I had to install the programs that I use on a daily basis, beginning from audio/video players to browsers to linux utilities. And I've always wanted to write a shell script that would automate this task for me. It would add the relevant repositories itself, download and install them instead of me having to do everything one after another. I am still trying to implement an adaptive step size RK routine. So far, I've been able to implement the step-halving method but not the RK-Fehlberg. I am not able to figure out how to increase the step size after reducing it initially. I've never understood what the term 'Object Oriented Programming' meant. After I started programming in Python, I got introduced to functions and eventually, when I was checking out professional python code, for example from the astropy repository, I noticed classes in python. I didn't try understand what classes are by myself and the few people who attempted to explain it to me weren't successful. I finally tried last weekend what classes in python were used for, how they were different to functions. Not only did I understand what classes are but I also understood that classes are used to create objects in python. This post and this one helped a lot in understanding how classes are written and used in Python. Now I need to look for a problem, which I am working on, which can be implemented using classes.